Interaction API tutorial section. For downloading Image, We will use same WebDriver Actions class with java robot class. For saving Image from web page In selenium webdriver, We have to perform bellow given actions. Select "Save Image As" option from mouse right click context menu. 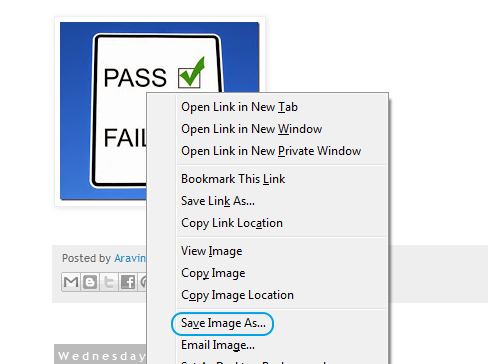 As you know, "Save Image As" option will display when you right click on any Image. We will use contextClick() method of WebDriver Actions class to right click on Image as shown In bellow Image. Code to right click on Image Is as bellow. //Rihgt click on Image using contextClick() method. If you see In Image, We can select "Save Image As" option using CONTROL + V from keyboard. To do It In selenium webdriver, We will use bellow given code. //To perform press Ctrl + v keyboard button action. It will open Save Image dialog. As you know, Actions class can help you to perform any action on web page only. It can not handle any windows dialog like Save Image. We can use Java Robot class to handle Save Image dialog. Robot class Is very good feature of Java using which we can send keyboard key press and key release events very easily to enter file name and press Save button on Save Image dialog. Code to enter file name "D:\test" and press Save button on Save Image dialog Is as bellow. // To press D key. // To press : key. // To press \ key. // To press "test" key one by one. // To press Save button. This way, We can save Image using Actions class of WebDriver and Robot class of java. Full practical example Is as bellow. VIEW EXAMPLE of robot class to close browser tabs. Where this Image is going to be store on local disk? Can we Right click using Robot Class and if yes then how to do it? Thanks a lot !! solves my inital problem. But now problem is i want change file name every time..i.e should be unique each time..plz suggest solution.